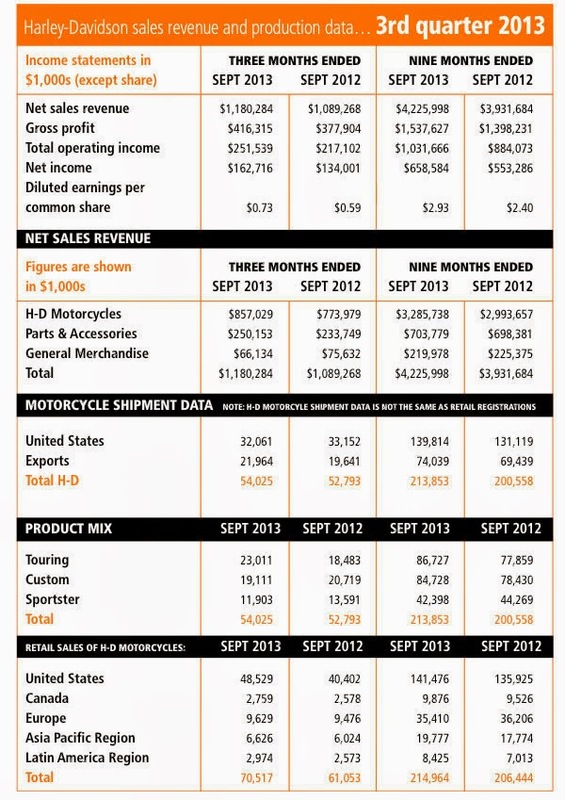 Harley-Davidson's third quarter fiscals (released October 2013) revealed improvements in earnings, sales income and motorcycle unit sales that had Chairman, President and Chief Executive Officer Keith Wandell purring as the company starts to bank the benefits of the draconian measures that he implemented on taking over as CEO four years ago. 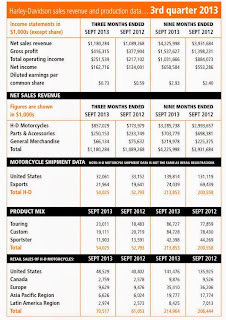 "Harley-Davidson had a great third quarter, with strong financial performance and retail sales growth," said Wandell. "Rider response to the 2014 motorcycles we introduced in August was extremely positive. In fact, initial retail sales of the new 'Project Rushmore' motorcycles sparked the largest year-over-year new model year sales increase in two decades. We also capped our year-long 110th Anniversary celebration in late August when throngs of riders joined us in Milwaukee from around the world for a huge three-day party like only Harley-Davidson can throw." "Everyone at Harley-Davidson is proud of our accomplishments and results so far this year, as we continue to see the benefits of our manufacturing, product development and retail strategies," Wandell said. 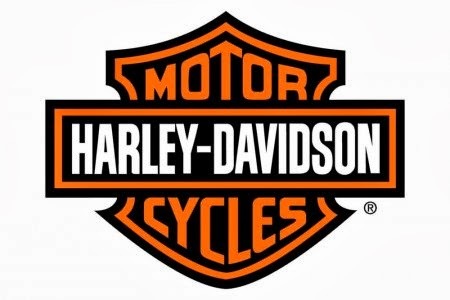 Dealers worldwide are said to have sold 70,517 new Harley-Davidson motorcycles in the third quarter of 2013, compared to 61,053 motorcycles in the year-ago quarter. In the U.S., dealers sold 48,529 new Harley-Davidson motorcycles in the quarter, up 20.1 percent, compared to sales of 40,402 motorcycles in the year-ago period. In international markets, dealers sold 21,988 new Harley-Davidson motorcycles during the third quarter, up 6.5 percent compared to 20,651 motorcycles in the year-ago period, with unit sales up 10.0 percent in the Asia Pacific region, 1.6 percent in the EMEA region, 15.6 percent in the Latin America region [Europe, Middle East and Africa], and 7.0 percent in Canada. Motorcycle shipments (as opposed to dealer sales) were said to be in line with prior guidance and up by 2.3 percent on the year-ago period at 54,025. Retail sales were said to be driven by strong double-digit growth in the sale of touring motorcycles following the third-quarter launch of the Company's 'Project Rushmore' line of revamped motorcycles. Harley-Davidson says that it continues to expect to ship 259,000 to 264,000 motorcycles to dealers and distributors worldwide in 2013. The Company continues to expect full-year 2013 gross margin of 35.25 percent to 36.25 percent. The Company also says that in the third quarter, it incurred restructuring charges of just $0.6 million. Harley-Davidson continues to expect restructuring activities initiated since 2009 to result in one-time overall costs of approximately $485 million, of which approximately $3 million will be accounted for in the 2013 fiscals. Against this, their balance sheet performance will see the benefit of savings of approximately $305 million in 2013 from those activities. This is said to be going to rise to annual ongoing savings of approximately $320 million beginning in 2014. For the nine months of 2013 so far, dealers sold 214,964 new Harley-Davidson motorcycles worldwide, compared to 206,444 motorcycles in the year-ago period (up by 4.13 percent), with retail unit sales up 4.1 percent in the US, 11.3 percent in the Asia Pacific region, 20.1 percent in the Latin America region and 3.7 percent in Canada, and down 2.2 percent in the EMEA region, compared to the first nine months of 2012. Third quarter operating income from motorcycles and related products grew 21.2 percent to $175.5 million in the third quarter of 2013, compared to operating income of $144.8 million in the year-ago period. Operating income in the quarter is said to have benefited from higher motorcycle shipments, higher gross margin and lower restructuring expense, compared to the prior-year period. Third quarter revenue from motorcycles grew 10.7 percent to $857.0 million, compared to $774.0 million in the year-ago period. Third quarter revenue from motorcycle parts and accessories was $250.2 million during the quarter, up 7.0 percent; revenue from general merchandise (which includes MotorClothes apparel and accessories), was $66.1 million, down 12.6 percent, compared to the year-ago period.